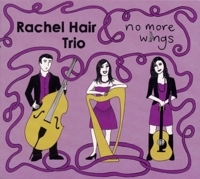 "Rachel Hair is never one to rest on her laurels and with this third album, she reinvents herself with characteristic aplob. Joining her on this outing are guitarist and singer Jenn Butterworth and Euan Burton on double bass. A couple of tunes from the fantastic Godlandstoner collection, from the Gotland area at Sweden. Originally published in the early 20th century, it’s now been republished online. The late folk singer, Cyril Tawney, was in the Royal Navy when he wrote this song about a seafarer wishing to be back name with his love. Rachel first recorded this beautitul tune by Galician musician Anxo Pintos on her debut album Hubcaps and Potholes. Two reels written by accordionists and one by a harper... controversial? The first tune is one at Phil Cunningham’s well-known reels and the second tune Rachel learnt from the Welsh group Jamie Smiths Mabon. She wrote The St James Lasses for the harpers at St. James the Great Comhaltas branch. Jenn’s self penned song about trying to reach someone who is unreachable. A couple of Breton Ridées and a Quebecois waltz. Fest Noz no. 7 is written for Rachel’s good friend and fantastic harpist, Tristan le Govic, the first person to teach her Breton dancing. Need a nearly new piggy bank, on 80’s keyboard, an old wedding photo? Jurby Junk on the Isle of Man is the place that sells everything you think you need and everything you know you don’t! A beautiful song with a dark sentiment wriften by Jesse Winchester. Jenn first heard this song on a recording by Emmylou Harris. A beautiful slow air from the Captain Simon Fraser Collection, a treasure trove of old Scottish airs and melodies. Home and Happy was written by Rachel offer a long 6 weeks of touring. Much fun was had but it felt great to be back home. A set of jigs starting off with a tune written by Breton guitar maestro Soig Siberil. The Folkus was written in celebration of Rachel’s car which can fit in all trio members, a harp, guitar double bass, amp, cd boxes, 3 suitcases and essential travel sweeties! Rachel wrote the final jig for fellow muso Joy Dunlop who is still waiting for a long overdue birthday present from her brother. He instead spent his money buying a pregnant cow called Nan!